Gwiv touted these wings before... and I have to say they were definitely 'ON' last nite. Sweeet! 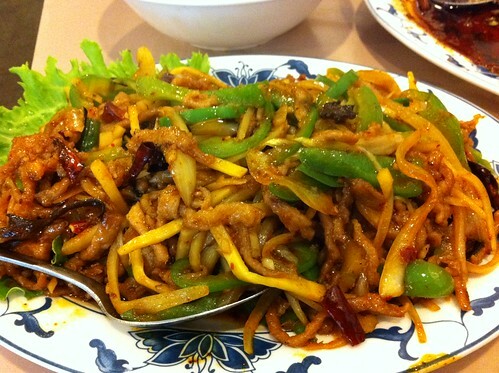 tangy, crunchy, yet moist inside w/ just the right touch of spiciness (we ordered extra spicy). Alas, being a Korean-Chinese restaurant, there's no panchan to speak of tho the obligatorily authentic onion w/ bean paste was served w/ the cha jiang mien. Ellen and I are in San Francisco and just got back to the hotel from an excellent meal at Town Hall, including a wee bit too much wine. I'm blaming it on the wine, but I am having tremendous difficulty resisting the double entendre, especially in light of your very attractive dining companions. Speaking of hot dogs, we had the SF Hot Doug's equivalent today for lunch, Rosamunde on Haight St. Grilled duck/fig sausage with caramelized onions and house made honey/wasabi/dijon and mergjuez with chutney. Excellent, especially washed down with a Thomas Kemper root beer. Great Sea was on last time I was there as well, got two orders of wings to go. Great Sea would be an excellent super bowl wing choice for those so inclined. I've never seen or eaten the 'real' thing, only the prepackaged dried version which is labeled "Chajang Myun" in Korean groceries (in Mitsuwa, it isn't in the ramen aisle, it's in the Korean/Thai/everybody else aisle at the other end of the store). My Korean boss tells me you rarely find it in Korean restaurants, but often in Korean-owned Chinese places. Unlike many prepackaged ramen, it isn't served as a soup, but sauced, with bits of soybean, onion and cabbage. The sauce is a dark brown (roasted?) bean paste that has scents of coffee and chocolate, and there's a packet of roasted onion oil that kicks up the flavors. The pictures above made me drool copiously. It's unlikely I'll get MrsF down to Lawrence for a Chinese restaurant, we'll end up at someplace Thai or Vietnamese or something if we're going into the city, but I've got to try that. If you ever find yourself on that corner during the late-nite hours (or anytime for that matter) again, I would recommend Swank Frank instead. It's the anti-Underdog dog. Crispy casing, chargrilled to order if that's your thing. Love it. I have to admit that I avoided it for a long time because if it's name, but I'm happy that I got over it. Great Sea chicken wings remain one of the best bites in the city of Chicago. Pump, crispy drumettes, oily chili sauce, subtle note of sweet. Delicious. G Wiv wrote: Great Sea chicken wings remain one of the best bites in the city of Chicago. Here, here... I had (more than) a few a couple ah' weeks ago and their power has not diminished with time -- or nuking. Might be back again this weekend, actually. Just roll them wings in the "Hot & Saucy" and you're good tuh' go! Last few times Great Sea wings have been mild, even though I've asked for hot, so this time I went up to the owner and asked, implored, for the wings to be sweat and tear inducing hot. As a long time customer she took me seriously and Lit Me UP. Truthfully, I can eat hot, love the occasional endorphin rush of a habanero, and, aside from Zim and my cousin The Goat King, can happily consume hotter/spicier food than anyone I know, Great Seas wings reduced me to a quivering bowl of melting lime green jello. The heat from powdered Korean dried red pepper was one dimensional with an effect like sandpaper impregnated with battery acid, two drumettes literally rubbed my throat raw, I could still feel the effects 18-hours later. My two lunch companions, Jazzfood and Ronnie_Suburban, neither a stranger to heat, were as incredulous as myself at the heat level. I liken it to the time I consumed a half teaspoon of Endorphin Rush straight. I should note the Korean style chicken wings at Great Sea, normally a delicious combination of crisp, meaty, sweet and spicy, are one of my favorite foods in Chicago, I specifically requested the over the top hot and, I'm guessing, after our reaction the owner is not likely to accommodate other similar requests. I am so glad there was a 25 mile distance between me and your wings. I'm not shuddering from the cold, I am shuddering at the thought of your capsaicin rush. As Gary posted, the supreme heat of those wings was like nothing I'd ever experienced before -- and not very pleasant. I think Gary's description is right on the mark. I too, love it hot, but this was several realms beyond anything I could tolerate. FWIW, here's a picture of the culprits, which doesn't look very different from the pic of the benign wings posted upthread . . . This reminds me of the summer I worked in a Chinese restaurant's kitchen - One of the uppity waiters decided to order kung pao chicken and pointedly stated, "And make it hot!" Now the kitchen staff never really liked the wait staff, so when this annoying pip asked for it hot... the young chefs in back made it hot. Typically the "kung pao" sauce was made via a dropper of industrial pepper extract, which came in a plastic jug, was a clear liquid and had huge warning labels on the side saying to avoid eyes and other mucous membrane, into a vat of sweet-ish soy sauce. So, the chef went into the freezer, poured out half a bowl of the clear extract and stir-fried it into his dish. In retrospect, the aerosolization of this clear extract probably would have been very dangerous to us in the kitchen, but we were all young and didn't know any better. Well, we all had a good laugh when the waiter stumbled back into the kitchen with his almost untouched plate of food, tears in his eyes and grunts of pain when asked, "So, was it hot enough for you?" Not that I'm calling you guys as such, but I suspect it wasn't just chili powder that made it into the dish; I'm guessing some industrial grade sabotage. Jay K wrote: Not that I'm calling you guys as such, but I suspect it wasn't just chili powder that made it into the dish; I'm guessing some industrial grade sabotage. I highly doubt the owner of Great Sea would wish to sabotage a two decade long customer with a history of polite interaction and over tipping. She simply, nice woman that she is, accomadated my lunchtime request to the best of her ability which, apparently, exceed my ability to consume hot and spicy food. No booze, funny hats or expletives were involved in my request. WOW - those look good! And very pretty too, I might add. They certainly don't look hot as you describe but I'll take your word on it! GWIV, you mention Endorphin Rush - I own that and although an extract product, I can tolerate it pretty well now - I think the scoville units on that are around 35,000 - which is a lot - but I've consumed much hotter - if you can believe! BTW - why did you eat it straight? That is crazy! Snark wrote: BTW - why did you eat it straight? That is crazy! Why did I eat Endorphin Rush straight? Hummmmm, good question. Best of my recollection there was booze and a dare involved. Great Sea has been nominated as a Great Neighborhood Restaurant. Please, discuss the nomination in this thread. Discussion ends on March 7. Great Seas is one of those places that has been a part of the LTH Forum DNA for so long, it's amazing that it's not yet a GNR. Although I normally take a pass on the cha jiang mien and don't even consider any other food on the menu, the wings are a singular dish that puts the Great in Great Seas. Being the spice lover that I am, I appreciate the fact that you can tayor (tailor) the heat level from a nice tickle in the back of your throat to beyond ridiculous. Normally, I find the one or two X to be just the right amount of heat to enjoy and still break a sweat, but I've been known to go higher on occasion. I definitely support this nomination, and I hope someone arranges a lunch or dinner there in the near future because I'm overdue for a visit. stevez wrote: Great Seas is one of those places that has been a part of the LTH Forum DNA for so long, it's amazing that it's not yet a GNR. I have to say I thought it was also, mea culpa! I heartily third this nomination. Sula first put it on my radar with his discussion of cha jiang mien and while not my favorite noodle dish , I can appreciate it's funky sensibility and the wonderful hand made noodles. Their chicken wings have become a staple at my house for parties, people now phone first to see if I'm bringing them in. I like to up the heat, but even when I have to tone it down for others they still taste amazing, wonderful lollipops of crispy goodness bursting with flavor. Damn, just thinking about them has made me hungary, now I have to make a run to GS. To me, Great Seas is the quintessential one trick pony. You'll get no argument from me that their wings are sensational -- the best of their kind in the city that I know of -- but beyond that, there's nothing else I've even remotely liked there. Is being great at one thing enough for GNR status? I can't answer that question but if the answer is "yes," then Great Seas is definitely a GNR. ronnie_suburban wrote: To me, Great Seas is the quintessential one trick pony. You'll get no argument from me that their wings are sensational -- the best of their kind in the city that I know of -- but beyond that, there's nothing else I've even remotely liked there. Is being great at one thing enough for GNR status? I can't answer that question but if the answer is "yes," then Great Seas is definitely a GNR. Good point, I never get anything but the wings. But, oh, those wings! Sorry to hear your other experiences at Great Sea(s) weren't exceptional, ronnie. Maybe it would help if I offered a different perspective on the wings? Since I started making the restaurant a regular destination in the '90s, the gampongi (drumettes) always served as that special icing on the cake (so to speak) for the rest of my Chinese-Korean meal. Usually those dishes included Mongolian beef, the aforementioned tan su yuk (sweet-and-sour pork), and mapo (spicy soft) tofu as complements to the sticky-rice filler. I never was a big fan of cha chiang mian (the black noodles) or champong (spicy seafood noodle soup) -- at most any restaurant -- but the Chinese and Korean folks I often ate with ordered those dishes frequently as well. So while the wings were certainly a favorite of most everyone attending, they generally weren't the sole focus of the meal. I'm actually intrigued by this garlic pork being mentioned in the related Great Sea threads and wouldn't mind evaluating it for inclusion in future Lawrence-Avenue feasts with both family and friends. My point in all this? Based on the strength of all my numerous incredible meals here (minus a few missteps with the Mongolian beef some years back), I officially pile on to support and personally endorse the nomination of Great Sea as an LTHForum Great Neighborhood Restaurant. (Don'tcha just love early voting?) Also, the value can't be denied. "Black Noodles and Other Delights"
P.S. I am curious which dishes really turned you off, ronnie. Care to share in detail? With the exception of crappy Bari, which inexplicably made it because it happens to be located next to a good bakery, those are all places that specialize in the one thing they do well. Great Sea is a full service restaurant with a much wider menu, and I think it's fair to factor that in. How I could not support a restaurant that makes one of my few favorite dishes in all of Chicago. I'd have a hard time choosing between Great Seas and Toons for my favorite wings in Chicago, but what's clear is that both versions are superior to all others I have tasted. I can't tell you how many times I've had a rough day, only to stop at Great Seas for a wings-pick-me-up. A GNR in my book. Kennyz wrote: those are all places that specialize in the one thing they do well. Great Sea is a full service restaurant with a much wider menu, and I think it's fair to factor that in. Not sure of your definition of specialize, but 95% of tables at Great Sea order chicken wings and 99%* of take out orders are wings. ...95% of tables at Great Sea order chicken wings and 99%* of take out orders are wings. Yep, that sounds about right. Ronna and I were there yesterday, and I think 100% of the tables ordered the wings. We were just not smart enough to stop at wings, and also ordered cha chiang mian and spicy garlic pork. The wings were good, but not great. We asked for the wings to be "extra spicy"; they came out sweet and crispy, but what I'd call zippy rather than hot. It was our first time there, and maybe one has to develop a rapport with the staff to get truly spicy (but not blisteringly spicy) wings. If the other items we ordered were great, I could see us going back and trying again, but they weren't. The black noodles were okay. I found them to taste mainly of mud and onions, with just a bit of chewy pork. The texture of the noodles was nice, and the earthy funk pleasant enough, but again, I'm not planning to run back for more anytime soon (or pull the takeout container out of the fridge to finish them). I can see why they've been described as an acquired taste. On the spicy garlic pork, Great Sea brought the heat that they held back on the wings. We repeated our request for "extra spicy" and holy cow did we get it. This was a pretty generically Ameri-Chinese dish that reminded me of Mongolian beef and tasted of flavorless pork, greasy green peppers, corn starch slurry, and loads of capsaicin. I'll probably eat the leftovers, but I'm not that excited about it. So, yeah. Good wings that could probably be great if one manages to communicate effectively with their server. Nothing else was terribly impressive. A GNR? Maybe yes on wings alone, but I'm not sure. easy solution if they get the GNR, just have the quotes/review blurbs that are included to say that only the wings are great. Is this the place that also has spicy fried smelts? I couldn't find a menu online. If so, that's two fine dishes. RAB wrote: The wings were good, but not great. We asked for the wings to be "extra spicy"; they came out sweet and crispy, but what I'd call zippy rather than hot. It was our first time there, and maybe one has to develop a rapport with the staff to get truly spicy (but not blisteringly spicy) wings. I have been advised that I just did it wrong. (I get that a lot.) Apparently, if one wants spicy wings at Great Sea, one must order them on "the X Scale" (2X, 3X, 4X, and on up). "Extra spicy," it seems, is a completely meaningless designation.